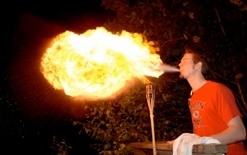 This stunt entails you soak your hand in Bicardi 151, then light your hand on fire, put it up to your face and spit from your hand like you're holding a torch. This can be VERY dangerous as the Bicardi burns away quickly and can cause burns if not extinguished. I want to give Kellan credit for this stunt, but I'm taking the award for having spit with oil which creates a bigger flash for better presentation. Thanks Kellan.